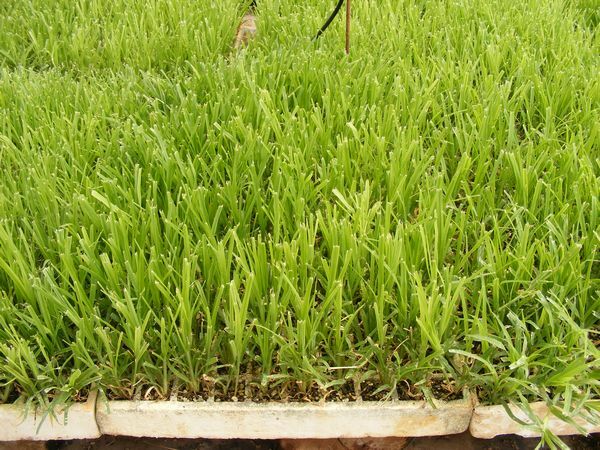 LM grass was named after the colonial name of the capital city of Mozambique, Lorenzo Marques – today called Maputo. LM Grass is an indigenous, evergreen creeping perennial grass and it is by far the most popular lawn grass in South African gardens. It has a medium coarse texture and it is a lighter shade of green than most lawns. LM must not be mowed too short as is a surface runner. It is well suited to shady areas and it can be grown in full sun as well. LM is a low maintenance lawn that has excellent tolerance of drought and heat. It is adaptable to a wide variety of soil conditions and has moderate traffic tolerance. It can be planted to stabilise sand both inland and at the coast. 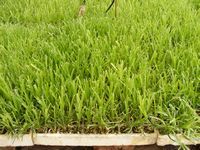 LM grass is palatable and can be utilised by animals, although it is not very leafy. When planted, the seedlings can be spaced from 15 – 25cm apart. The closer they are spaced the quicker it will grow into a dense lawn. We are selling trays containing 200 strong seedlings. Minimum order is one tray.